sFLC concentrations and κ/λ ratios are maintained within narrow limits in normal individuals. Ethnicity appears to have minimal influence on sFLC normal ranges. sFLC concentrations increase substantially and κ/λ sFLC ratios increase slightly with decreasing renal function. Use of a modified renal reference interval for the ratio increases the diagnostic specificity for detecting monoclonal FLC production in patients with renal impairment. FLC concentrations in serum are less variable than in urine. Figure 6.1. κ and λ FLC concentrations in 282 normal sera plotted on a logarithmic scale. Figure 6.2. Effect of age on sFLCs. 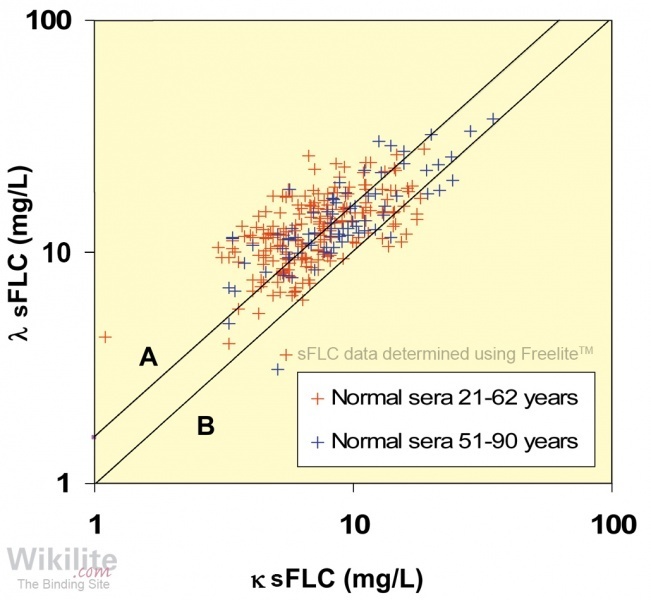 The most substantial study of sFLC concentrations in normal individuals using Freelite was published by Katzmann et al. . Serum samples were obtained from 127 healthy blood donors (21 - 62 years) and 155 older, normal individuals (51 - 90 years). The κ and λ sFLC concentrations for the 282 serum samples are plotted in Figure 6.1 and the normal range data is summarised in Table 6.1. The 95% reference ranges for κ and λ sFLC concentrations and κ/λ sFLC ratio were 3.3 - 19.4 mg/L, 5.7 - 26.3 mg/L and 0.3 - 1.2, respectively. It was proposed that the 100% reference range for the ratio (0.26 - 1.65) should be used diagnostically, in order to minimise the number of false-positive results when screening for monoclonal FLC production. This 100% diagnostic range has now been generally adopted and is incorporated into guidelines (Chapter 25). The utility of Freelite sFLC measurements for identifying FLC monoclonal gammopathies is discussed in Chapter 23. Table 6.1. Mean/median values and ranges for FLC concentrations and κ/λ sFLC ratios in the sera of 282 normal individuals . Katzmann et al. observed that κ sFLC concentrations tended to be lower than λ, giving a median κ/λ sFLC ratio of 0.59. This is because serum FLC levels are dependent upon the balance between production and clearance. There are approximately twice as many plasma cells producing κ FLC as there are producing λ FLC. However, as κ molecules are normally monomeric (25 kDa), their renal clearance is faster than λ molecules, which tend to be dimeric (50 kDa). Consequently the serum half-life of κ FLCs is shorter than λ, and κ FLCs accumulate less in serum leading to lower concentrations of κ sFLC in normal individuals (Chapter 3). In elderly people there was a trend towards higher sFLC concentrations (Figure 6.2.a,b and Table 6.2) . The same trend was observed for the renal function marker, cystatin C, which was measured in the same samples (Figure 6.2,d). 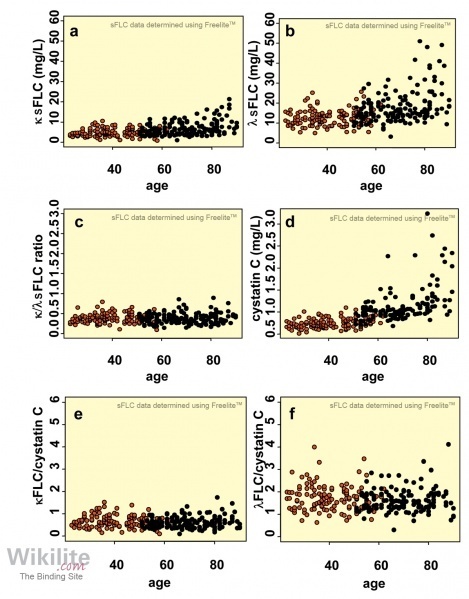 When the results were expressed as sFLC κ/λ ratio or a ratio of sFLC concentration/cystatin C concentration, the effect of age was eliminated or reduced (Figure 6.2 c,e,f). This indicates that the higher sFLC values seen in older people can be largely explained by small reductions in glomerular filtration rate (GFR) . Whilst several other groups have similarly observed no significant age-related differences in the sFLC ratio , others have reported an increase in the κ/λ sFLC ratio reference range in elderly populations, prompting the suggestion that age-dependent reference ranges should be considered . Table 6.2. Median values for sFLCs and κ/λ ratios in different age groups . The normal ranges published by Katzmann et al. were very similar to those previously reported by Bradwell et al., who observed a mean κ/λ sFLC ratio of 0.6 and a 95% reference range of 0.35 - 1.0 . Slightly lower κ and λ sFLC concentrations (95% reference ranges of 4.2 - 13.1 mg/L and 9.2 - 22.7 mg/L, respectively) observed in the Bradwell study may be attributed to a younger study population (17 - 71 years). The Freelite normal ranges published by Katzmann et al. were established in an American, predominantly white, population . Known ethnic differences in the normal ranges of total immunoglobulins (Chapter 10) have prompted a number of laboratories to determine normal sFLC ranges for their local populations. European research groups have reported Freelite reference ranges for normal individuals that are comparable to Katzmann et al. . Similarly, sFLC concentrations in a small South African cohort including Black (57/113), mixed-race (44/113) and Caucasian (12/113) subjects were not significantly different, both for the local population as a whole, and for the Black and mixed-race populations independently . In a Han Chinese population of 326 subjects, although a narrower κ/λ sFLC ratio normal range was observed (0.32 - 1.52), this local range and the Katzmann range (0.26 - 1.65) provided the same diagnostic sensitivity and specificity for multiple myeloma (MM) (area under ROC curve 0.99 in both cases) . A multi-centre Indian normal range study  reported slightly higher concentrations of κ and λ sFLCs compared with those reported by Katzmann et al. (both p<0.01). The concentration of κ sFLCs was slightly higher than that of λ sFLCs, and consequently the κ/λ sFLC ratio (0.36 – 2.33, 95% range) was also higher than that reported by the American study . The authors suggest that their findings are consistent with the lower glomerular filtration rates of normal Indian subjects than those of Western populations (Section 6.3).